Vitamin D is a group of fat-soluble secosteroids responsible for increasing intestinal absorption of calcium, magnesium, and phosphate, and multiple other biological effects. In humans, the most important compounds in this group are vitamin D3 (also known as cholecalciferol) and vitamin D2 (ergocalciferol). Cholecalciferol and ergocalciferol can be ingested from the diet and from supplements. 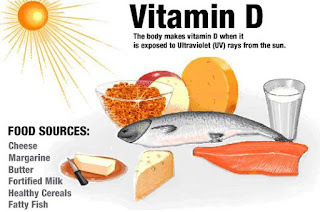 Only a few foods contain vitamin D. The major natural source of the vitamin is the synthesis of cholecalciferol in the skin from cholesterol through a chemical reaction that is dependent on sun exposure (specifically UVB radiation). Dietary recommendations typically assume that all of a person's vitamin D is taken by mouth, as sun exposure in the population is variable and recommendations about the amount of sun exposure that is safe are uncertain in view of the skin cancer risk.